The WRAP for Life Group Bundle includes WRAP for Life, 20 WRAP Workbooks, 20 My WRAP and 20 My WRAP Crisis. The WRAP for Life Group Bundle provides great resources to share with support groups in one convenient bundle. If you bought the items individually they would cost $204.95. We bundle it together for only $184.50 – Buy the bundle and SAVE! This book can serve as your day-to-day guide for working on personal issues and enriching your life. It is used to help address issues related to “whole” health. This book contains the WRAP forms, forms for the lists and for the action plans, as well as forms for the Crisis Plan (Advance Directive) and Post Crisis Plan. It also has brief descriptions of each part of WRAP. My WRAP is a pocket-size way to keep your Wellness Recovery Action Plan in your purse, wallet or pocket. This colorful brochure offers a very convenient way to carry your WRAP with you. Refer to your WRAP or make additions while you’re on the go. My WRAP Crisis Plan is a pocket-size way to keep your Crisis Plan in your purse, wallet or pocket. 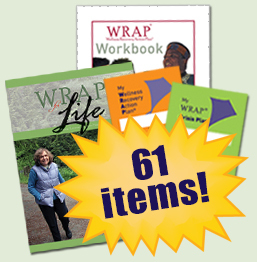 This colorful brochure offers a very convenient way to carry your WRAP Crisis Plan with you. In the event of a crisis, it’s easy to share it with supporters and care providers.